The Constitution is the "supreme law of the land" so how we interpret that document is crucial to analyzing American law. 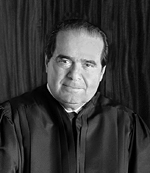 Justice Scalia is a vocal advocate of "originalism," for which he is often praised, but also often criticized. Ann Woolner recently published an op-ed, Women Aren't People Under Scalia's Constitution, in which she criticized Scalia's originalism. There's just one problem... she doesn't understand Scalia's originalism. I hope this post will help clear up this common misperception. Here we have a perfect example of what’s so very wrong about so-called originalism, the theory Scalia claims to follow. The idea is that the Constitution should be interpreted according to its authors’ original intent, no changes allowed. (emphasis added). While some self-professed "originalists" subscribe to this theory, Justice Scalia is unquestionably not one of them. Government by unexpressed intent is . . . tyrannical. It is the law that governs, not the intent of the lawgiver . . . . Men may intend what they will; but it is only the laws that they enact which bind us. It is curious that most of those who insist that the drafter's intent gives meaning to a statute reject the drafter's intent as the criterion for interpretation of the Constitution. I reject it for both. What I look for in the Constitution is precisely what I look for in a statute: the original meaning of the text, not what the original draftsmen intended. (P. 38). I think that's a pretty concise explanation of the difference between Scalia's originalism and intent-based originalism. Scalia's main essay in A Matter of Interpretation is only 45 pages. I highly recommend it for anyone interested in this subject. His book also includes comments and criticism from leading scholars (Amy Gutmann, Gordon Wood, Laurence Tribe, Mary Ann Glendon, and Ronald Dworkin). For a different take, Justice Breyer published his own book addressing interpretation, Active Liberty .